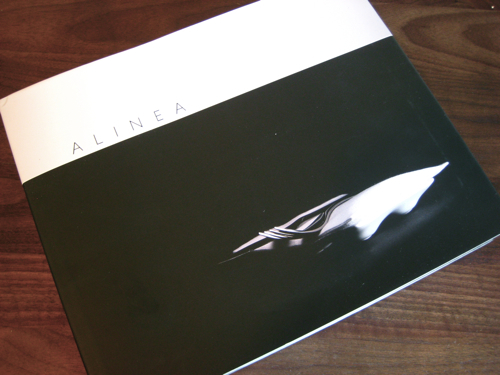 The new Alinea cookbook (buy at Amazon ) is pretty spectacular, but I could like it more. I love the writing by Jeffrey Steingarten and Michael Nagrant, and it turns out Alinea managing partner Nick Kokonas has a real way with words. But as a book (with pictures and recipes, not just words) I think it's problematic. This is a book that's not sure what it wants to be. It hasn't decided whether it's an artifact documenting the phenomenon of the Alinea kitchen, or if it's a link between the restaurant and the home cook, or if it's a tool of the brand. It's not sure if it's a coffee table book, or a cookbook, or Other. 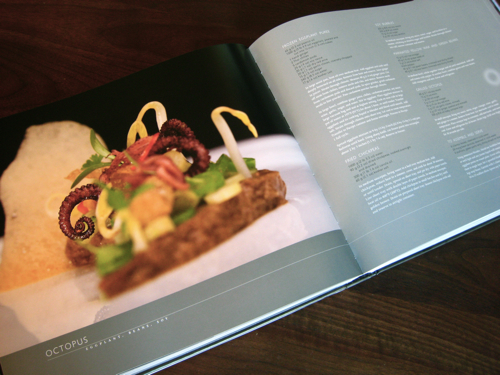 In his introductory essay "How to Use this Book," Nick Kokonas hints that the team behind it were aware of Alinea's crisis of identity. He's not really telling you how to use this book, he's defending the intricacy of its recipes and urging you not to take them literally. But that doesn't sit well with me; I want them to take a side. They should admit that this is a recipe collection that's unapproachable for most people, and sell it like A Day at El Bulli. Not to cooking from, but more as a source of inspiration. Or, alternately, they should present this as a real cookbook, with a straight face. They should be saying "these are the recipes, cook them. If you can't cook them, don't buy the goddamn book." 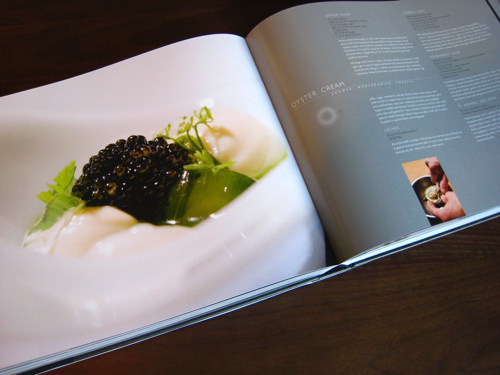 My guess is that many of the reviews of Alinea are going to try to define the book, and invariably there'll be a comparison to The French Laundry Cookbook. They're both gigantic hardbacks with unwieldy dimensions and an obsessive focus on precision. Not to mention that there's a nice human-interest angle to the fact that Thomas Keller was Grant Achatz's mentor. But the books are more different than they're alike. Here's an oversimplification: French Laundry is accessible. Keller's whole thing, his metier, is taking everyday food (lettuce, cheese, oyster, chocolate) and doing it up in such a way that its essence is revealed. The portions at his restaurants are so small because the one bite of marrow that you get is all you need - it is one perfect bite of marrow, it is the platonic ideal of marrow, reduced and contextualized to contain all marrow of all cows on all ranges in that one bite. What Keller does is edit food down, distill it, and that's something people can do at home. If they can't do it at home, it's still something they can wrap their heads around. Imagine a lamb chop, but it's the best, most succulent, most intense lamb chop you've ever had. Imagine it melting in your mouth. Imagine it surrounded by peppery greens whose flavors are so intense that they seem to crystallize. You can do it, right? Your mouth is watering. All you have to do to describe Keller's food is name the ingredient, and then say "and now imagine that as the best, most intense version of that possible." Keller is accessible. Achatz, on the other hand, isn't. Imagine a blackberry. Now imagine it's on a sheet of tobacco-flavored whipped cream, made with a crushed cigar, and the cream is set using gelatin so it doesn't feel in your mouth like whipped cream. And top that with smoked salt, and bee balm (or mint, if you can't find bee balm), and peppercorns. Imagine that. Are you imagining it? Is the flavor in your mouth? Alinea isn't accessible in the same way. In the right context, this lack of accessibility isn't a bad thing. It's what makes eating at Alinea so extraordinary, that the flavors and sensations and textures are turned inside-out and on their ear. A meal at Alinea isn't a meal - it's multisensory performance art, it's the culinary equivalent of dropping acid, it's palate-expansion. The problem is that palate expansion is intimidating, for all that it's exhilarating. In the dining room at Alinea, it's evident that even in its most accessible form, it's not for everyone. There's the guy who looks at the piece of bacon hanging from a metal clothesline and, even if he's not saying it out loud, you know he's thinking what the hell is this? I didnt sign up for clothesline bacon. But in a book, it's even more distant: We're put in a position of having to imagine the unimaginable, we're being asked to think of an eighth color or a sixth physical sense. What Grant Achatz is doing in his kitchen is so different from what we're used to thinking of as dinner, that when it's presented to us on a plate, we hesitate. When it's presented to us in a book, we flounder. We don't know what to think, or how to process it. We'd flounder much less if this book told us what it was. 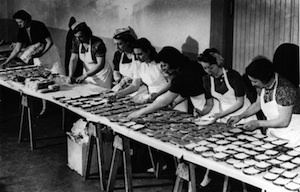 We'd be relieved of the responsibility of worrying that we're expected to make neutral caramel (ingredients: fondant, isomalt, glucose) with which to drizzle our oxalis pods and squab rillettes. The front cover of The French Laundry Cookbook is white, and it shows a napkin and silverware. Alinea's cover also shows nothing more than a napkin and silverware, but the background is black, and the knife and fork are in shadow. Dark cover, dark pages, dark photographs. Even though it's beautiful and groundbreaking and magical, this is an intimidating book, and the lack of self-definition makes it even more so. It doesn't need to be. I could like it more.